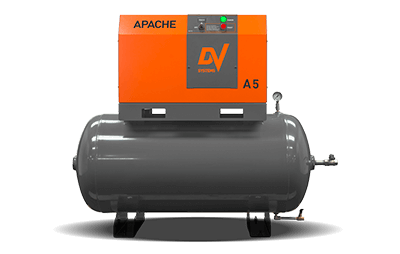 SFP offers the DV A-Series AST Apache Airsystem rotary screw air compressor which delivers economical operation and is well suited for heavy duty applications. The unit is capable of providing continuous, quiet operation for those applications requiring dependable air. The leading-edge part integration design results in a system that a small installation footprint. Electronic draining removes only condensate without wasting compressed air to discharge it from the system. It removes any potential condensation from the tank on a routine basis, which helps to ensure that the system continues to run at peak efficiency. Boost your systems air quality and productivity by adding a refrigerated air dryer to your new rotary screw compressor. The DV Air Dryer Package contains an air filter canister, a 1 Micron filter, and adapters to attach the air dryer, which can come already mounted on the unit, or separate if needed. DV offers tools, accessories, and installation in support of their air compressor product line. To learn more about DV’s air compressors and how they can help you fill out the quick contact form provided at the bottom of the page.